Howard, is a gal working in an overpopulated field but, with Ella, Billie, Anita, Peggy and so many others out of the race, her discs are going to show. A voice that is bluesy, occasionally theatrical (in the nicest sense of the term) and always totally immersed in the lyric. Manhattan is simply fantastic. One minute it's in English, well no, it's actually American (girl/goil) then it's in French - brilliant! This lady is a singer, composer, arranger and one who makes you believe the words she is singing. Behind her are some of New Yorks finest all contributing to this rather special bite of the Big Apple. The final track sums it up - But Beautiful! 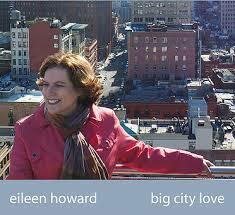 Eileen's version of Sunday in New York should be adopted by the city's tourist board! Big City Love is released on March 31 and the launch party is at West End Avenue (West End & West 107th at Broadway). Your rendition of Sunday In New York. representing NYC. Well! Can't wait to hear the rest of your love songs to the Big City . . . Thanks so much, Lance! Thanks for spreading the gospel of Jazz and I hope to meet you in person one day.